A website and mobile app allowing a fast, cheap and easy way of producing results for timed rowing races. A race administrator creates a race via this website. This can include multiple leg races (e.g. head to head). Races can include 'split' times. Races can also be set up to have combined categories and include veteran handicaps, which are calculated automatically when the results are uploaded. Entries can be uploaded from a Comma Separated file. The Results are available immediately after being uploaded. They can be shown only at the clubhouse, published in a provisional form, or fully published once the administrators are satisfied with them. If necessary, results can be edited via the website, or merged with a backup timing system. Time penalties can be added. Results can be downloaded from the website in a Comma Separated file format. Login or Register and then select Races (both from the top menu) to get started! 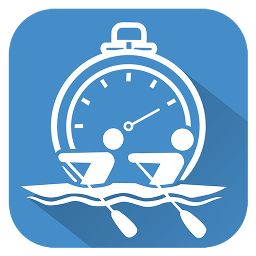 Timing Marshals download the RowClock App onto their mobile Android device. The App is time synced automatically. The App provides a list of boats during the race to help work out who each crew is (particularly useful if they've lost their number). During the race, the timers push a button to log when each entry reaches that timing station. The App makes it easy to deal with missing numbers, no shows and extra entries. Immediately after the last boat in a division has past the timing point the App allows the Timing Marshal to upload the results. Multiple Timing Marshals can time at one location in order to provide a backup. Look at the App page for more details and user instructions. Results are stored on this website and kept for posterity. This website is written in a mobile device friendly format, so can be viewed easily from phones. If necessary, results can be edited by the race administrator via the website, or merged with a backup timing system. They can be viewed by overall time, division or category. You can link directly to the results within your own web page if desired.